The world's most versatile measuring software package has become even better. 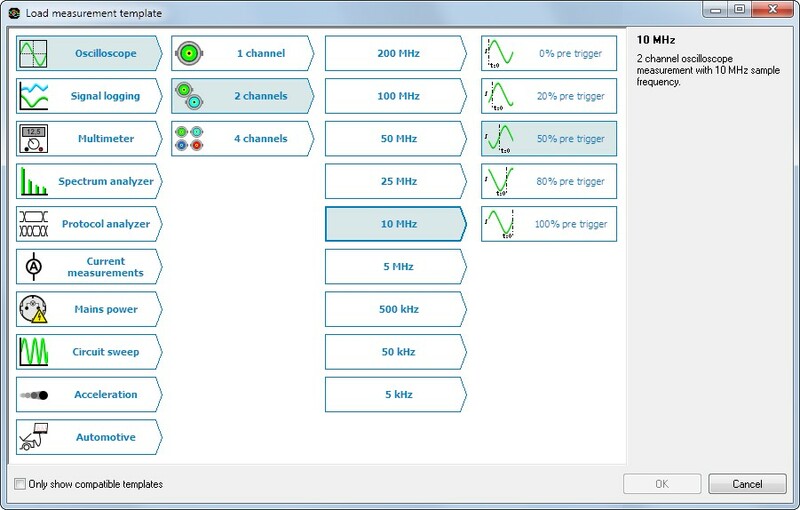 To simplify setting up measurements, a measurement templates system has been added to the TiePie engineering Multi Channel oscilloscope software, containing a large number of measurement templates. Do you want to use an oscilloscope with 2 channels, 10 MS/s sampling rate and 50 % pretrigger? A few mouse clicks and you're ready to measure. Or do you want to generate a sweep from 1 Hz to 1 MHz to test a filter circuit and measure the frequency response of the system? Load the template and your instrument is set up to do the complex task. Any complex instrument setup is now reduced to a few mouse clicks. The templates are selected and loaded via an intuitive and easy to use selection dialog. You can open it via the File menu or by clicking the button on the toolbar. The templates are divided in various categories, ordered by application, with sub divisions up to 3 levels deep. Sub divisions include e.g. the number of channels, the frequency range, the input range, the serial data protocol, the bitrate, etc. A large category with various automotive measurements is included as well. This extensive measurement template system with well over 300 different measurement templates is unique for the TiePie engineering Multi Channel oscilloscope software, no other oscilloscope software offers this. For more information regarding the template system, see the Measurement templates page on our website. 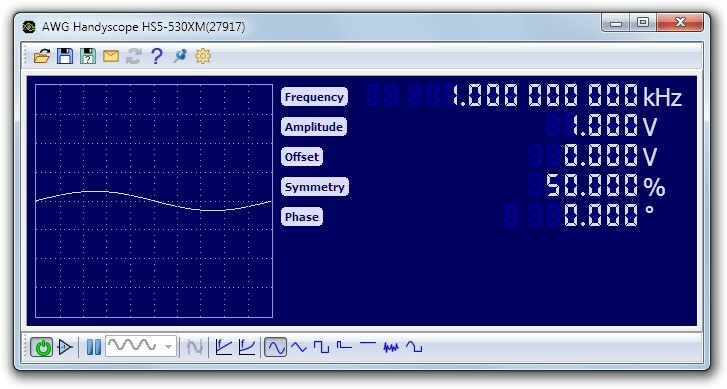 A new signal type is added to the function generator: Pulse. This signal type gives a pulse with a user selectable period time, width and height. The period time of the pulse can be set between 100 ns and 1000 s. The width can be set between 20 ns and "period time - 20 ns", with 6 digits resolution, with a minimum of 1 ns. An output invert option is added to invert the generated signal pattern. The signal is inverted around the selected offset level. Several new burst and gated modes have been added to the arbitrary waveform generator. They allow very precise control of the generated signal via an external trigger signal. The readability of the property displays has been improved by moving the decimal separator, removing leading zero's and adding a prefix to the unit. For example 0.000200 s is now displayed as 200 µs. Graphs nows resize proportionally when their containing window is resized. Positions and sizes of graphs are now saved and restored when loading a set file. When a graph is zoomed in deep, digits are added to the labels along the horizontal axis, to show their difference in value. When a graph is zoomed in deep, it no longer zooms out when the record slider is moved. For in-depth information on the versatile Multi Channel oscilloscope software and our USB oscilloscopes, visit the Multi Channel oscilloscope software feature description and the classroom on our website. Multi Channel oscilloscope software 1.32 requires a new driver (version 7.2.1) for the Handyscope HS5, Handyprobe HP3, Handyscope HS4 DIFF and Handyscope HS4. The new drivers can be downloaded from the download pages of the instruments. This new driver solves an issue on USB 3 ports where the instrument freezes and needs to be disconnected and reconnected to be able to perform measurements again. It also solves an issue when using VirtualBox, USB 2.0 (EHCI) support no longer needs to be disabled in VirtualBox to use the instrument.